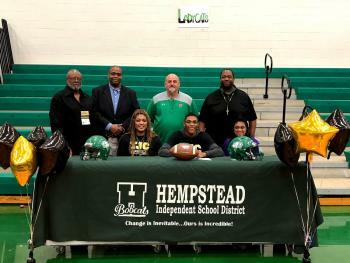 Hempstead High School senior Trevon Carter signed a letter of intent with Tyler Junior College on Wednesday, February 6. Carter plans to join the Apaches upon graduation this year to play football under Coach Thomas Rocco. Family, friends, coaches, teachers and administrators were on hand to show support for Carter at the signing that took place during the NCAA National Football Signing Day in the HHS Competition Gym at Hempstead High School. Fellow teammates and classmates were also on hand to witness the event and show their support. Carter’s favorite high school highlight was scoring three touchdowns in one game for the Bobcats. He told everyone that after being hurt, he was happy to be able to go play football at the next level. Carter plans to study Kinesiology while at TJC and hopes to coach at the high school level after his football career. Congratulations to Trevon Carter on his accomplishments and scholarship to Tyler Junior College! Hempstead ISD wishes him the very best in his future endeavors. Pictured from the left are (front row) Karon Neal (mother), Trevon Carter, Chaniah Bennett (sister), (back row) Rev. Fred Thomas III, HHS Principal John Starling, Athletic Director Bobby Spain, and Head Football Coach Royce Hill.